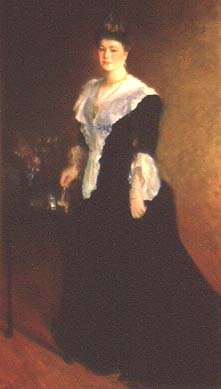 This portrait shows Lady Aberdeen as President of the National Council of Women of Canada. It then went on public exhibit in Montreal and Quebec. It was received as "a most valuable and interesting work on a large scale, accomplished by the most representative talent in the Dominion ... it is hoped that it will be accepted by the government and placed where it may be seen and studied and preserved to mark the first era in ceramics in Canada. "8 But the government did not wish to pay the $1000 which was the WAAC's asking price for the Cabot Commemorative State Service. Two socially prominent women, Mary Dignam, President of the WAAC, and Lady Edgar, wife of the Speaker of the House of Commons, arranged to meet with some members of the Senate and the House of Commons in the office of the Speaker of the House, to consider the disposal of the service. It was arranged that the State Service should be purchased, at the artists' prices, by means of a private subscription on the part of the members of the Senate and House of Commons, who should present it to Her Excellency the Countess of Aberdeen, upon her departure from Canada.9 Her husband, the Earl of Aberdeen, was about to end his term of office as Governor General of Canada. During their time in Canada, Lady Aberdeen was active in promoting the interests of Canadian women - she was commended "for her efforts in the direction of elevating the women of Canada." The "painted scenes" were taken from Canada to Scotland and placed in Lord Aberdeen's residence Haddo House, Aberdeenshire, in a splendid cabinet specially made for the Service (and designed in classical style to accord with the architecture of Haddo). Haddo House is now a National Trust for Scotland property. 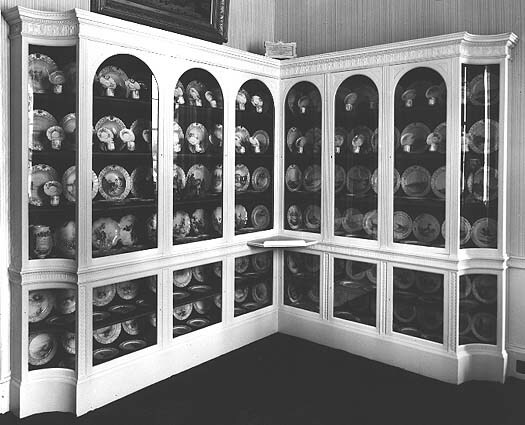 The Cabot Commemorative State Service still survives complete, in the cabinet in Haddo House - a monument to Canadian artistic effort in a British Stately home.